First, let me say that I am a life-long Republican; and I do not believe in establishing a third party. My goal is to help the Republican Party to come back to its conservative roots. It is out of that concern that I speak. Among other points, these conservatives have objected to the fact that only 14 out of 46 Legislative Priorities that were tied to the 2010 Republican Platform were ever brought to the House and Senate floors for a vote during the 82ndLegislative Session! This means that only a very small number of conservative bills even made it out of committee. Lt. Gov. David Dewhurst and House Speaker Joe Straus should be held accountable for this because they were the ones who appointed the committee chairs and members. [To read more about these committee chairs and members, please go to the article that I wrote on 8.8.11 and republished on 10.11.11 entitled “Dilemma for Texas Voters”. As a response to the concerns that have been sent to the SREC members by well-meaning conservatives, the SREC in turn has sent back a standard reply that sounds to me as if it has been taken from a scripted “talking points” memo. Therefore, I need to clarify some points, many of which are based upon the public record and upon my own observations and commentary. Steve Munisteri was elected as the State Chair of the Republican Party of Texas at the 2010 Republican Convention. According to Wikipedia, Munisteri has a very colorful background (http://en.wikipedia.org/wiki/Steve_Munisteri ). He came from a well-to-do Houston family, is a lawyer, and had his own law practice for 27 years in Houston. He is divorced, has no children, and has made much of his fortune by being a boxing promoter. He also served as the first state chair for Young Conservatives of Texas when it was founded in 1980. Since then, Munisteri seems to have changed; and I now question Munisteri’s conservatism particularly because of his relationship with left-leaning House Speaker Joe Straus. After Munisteri gained the chairmanship of RPT at the 2010 Republican Convention, he appointed the former RPT Executive Director Eric Opiela as the assistant legal counsel for RPT. Eric Opiela works for Joe Straus. No one seems to know exactly where Opiela is working for Straus, but it may be at the Johnson Law Firm which is the #1 gambling lobby in Texas. Please remember that Joe Straus and his family have made a living off the gambling industry. When Munisteri was elected to the RPT chair, he found binding rental contracts that had been negotiated before Cathie Adams (the previous RPT Chair) was elected in 2009. These rental contracts for RPT office space cost almost $20,000 per month or close to $250,000 annually. Ironically enough, it seems to have been Eric Opiela who negotiated those binding rental contracts. To pay for these expensive-yet-binding contracts, Munisteri sought the help of the “debt busters” who are Joe Straus’ lieutenants. Most of the money coming into the RPT is now coming from moderate Republicans who supported Kay Bailey Hutchison for Governor; Munisteri also was a Hutchison supporter. It is my opinion that the RPT and SREC are looking for excuses not to send out the already-prepared legislative voting report presented to them by Rep. Wayne Christian (the chair of the Platform Committee). This report was prepared free-of-charge by a third-party who is experienced at producing such reports in a factual and non-biased way. Munisteri, however, is pushing the SREC to ask another group to prepare a legislative voting report; but this time he wants ALL legislative votes to be published rather than only those that relate to the RPT Platform. If this second report were to be published, the votes that distinguish the legislators who adhered to our Platform and those who did not would be lost in the mass of votes. This was NOT the intent of the grassroots who voted to inform voters of how their elected officials voted on issues related to our Platform. Munisteri has even gone so far as to offer to pay $10,000 for this second report himself; but based upon his past history and liaisons, I for one cannot trust him. How do we know that Joe Straus is not sticking $10,000 in one of Munisteri’s pockets while Munisteri is writing out the check with his other hand? Besides, if Munisteri “pays” for the report, then he will be able to control the content of the report. What good will it do for voters to have a massaged legislative voting report to take with them to the polls? Bottomline: The 6,000 delegates spoke with one voice at the 2010 Republican Convention; the RPT and SREC need to act upon that vote. The parliamentarian and legal counsel at the convention said the proposal was valid and did not go against the bylaws and rules. Wayne Christian was the duly elected Chair of the Platform Committee, and he did what he was instructed by the delegates to do. Why does sharing the voting record of legislators amount to influencing contests within the Republican Party? Obviously, it would not since the legislative voting report is non-partisan and contains no percentages or scores.This is a bogus argument being promoted by Munisteri to the SREC. 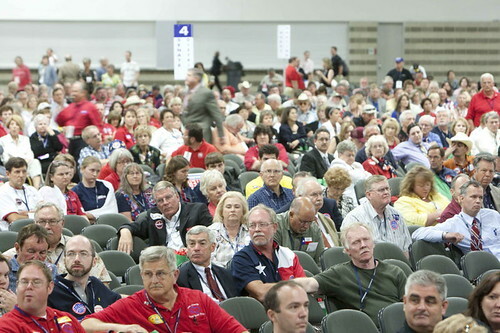 If Munisteri’s legal counsel insists that the plank as passed at the 2010 Republican Convention was not valid, then the SREC needs to change its Bylaws to fit the plank passed by the 6,000 delegates at the Convention. The SREC Bylaws should be in place to serve the people and not vice versa. I believe “Munisteri’s $10,000 idea” is meant to delay the legislative voting reportfrom being published. If the SREC does not meet until Dec. 4, 2011 and should decide to reject Rep. Christian’s report and produce yet another report, I doubt that this second report would be available in time to help the voters when they start early voting on February 21, 2012. We voters need the legislative voting report (approved by the large number of Republican Convention delegates) when we go to the polls in the 2012 primaries so that we can best choose those Texas Legislators who will vote for the bills tied to the 46 Legislative Priorities in the Party Platform. Those 6,000 delegates to the 2010 Republican Convention should not be satisfied until the plank that they duly passed is implemented correctly and the legislative voting report already presented to Munisteri and the SREC is sent outto the RPT voter base. The legislative voting report cost nothing to prepare because it was done by volunteers, and it will cost nothing to transmit by e-mail to the RPT voter base. RPT frequently sends out e-mails to its voter base; the legislative voting report needs to be transmitted in the very same way.